WesternOne Inc. today announced that its modular manufacturing division, Britco LP has won two international awards for Permanent Modular Construction. 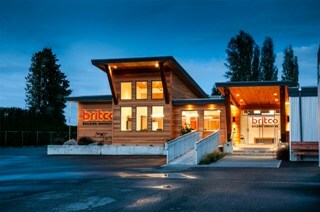 The expansion of the office space at Britco's modular construction facility in Agassiz, B.C. won first place in the permanent modular office category. Designed to be easily expanded as space is needed, the office building features vaulted boardroom ceilings and modern finishes. Britco also won the Permanent Modular Retail or Hospitality category, with Britco's Bank of Montreal branch in High Level, Alberta offering customers in this remote community access to full-service banking, including a bank vault, private offices, an ATM and a large banking hall. "Although we are increasingly well known as a leading manufacturer of workforce accommodations for large, remote work camp projects, over the past 40 years, Britco has become an industry leader in the design and customization of permanent modular construction projects," said Obie Erickson, President of Britco. "We're very pleased that the Modular Building Institute recognized the hard work of Britco's design and construction team. Britco has won 54 MBI awards since 1994." The MBI is the trade association representing companies in Canada, the United States and 14 other countries involved in the construction and distribution of commercial modular buildings. Entries were reviewed by an impartial panel of industry and non-industry construction and code experts, architects and engineers, and marketing professionals. Building entries were judged on architectural excellence, technical innovation and sustainability, cost effectiveness, energy efficiency and calendar days to complete.